Completed in 2002, this Seattle stadium was publicly funded following a King County election vote. A second, the Safeco Field, had already opened on an adjacent site in 1997. Both replaced the Kingdome, a massive circular concrete structure finished in 1976 and explosively demolished in 2000 after lengthy structural and operational problems. A multi-purpose facility, CenturyLink Field is home to the Seahawks who play in the National Football League and to other sporting teams. Oval in plan, the open playing area is flanked each side by seating under two segmental roofed stands and uncovered seating at the southern end. 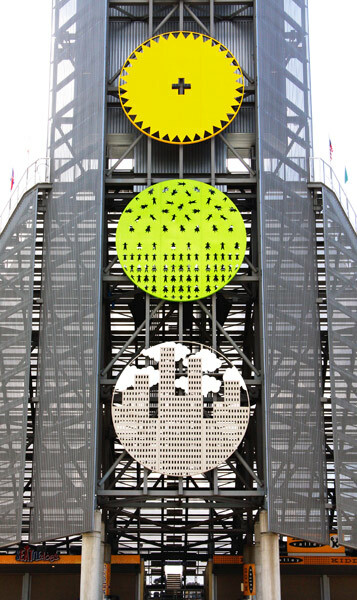 The tower structure in Images 1 – 3 carries a high-set scoreboard. I took these photographs from the car park and the flights of steps that lead up to the northern entrances. I liked the engineering intricacies of the structure, the positive and negative shapes it presents and the three stylised discs applied to it. 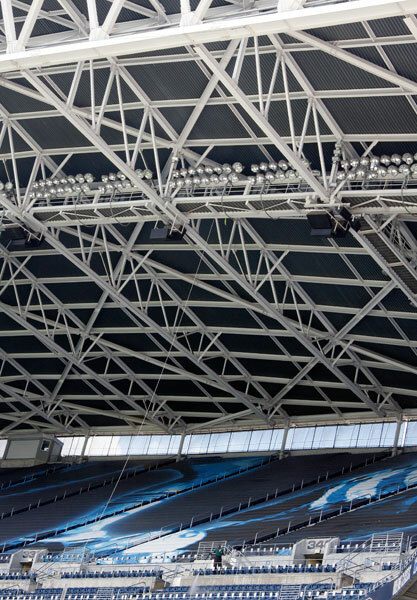 Both segmental roofs are suspended from single curved truss girders at their outer edge without any inner support. Apart from a few staff members the stadium was empty and silent. From outside, the distant murmur of traffic was occasionally covered by the sounds of passing railroad locomotives and aircraft using SeaTac Airport. The Safeco Field stadium is a contrast in engineering. Rectangular in plan, its long outer walls carry tracks on which three telescoping roof panels can be moved to cover the baseball diamond. When in their usual open setting they rest above the nearby railroad tracks running south from King Street Station. In recent years many of Middlesbrough's old or derelict industrial buildings have been removed from the Middlehaven Dock area by the River Tees. Some were subjects for the CORRUGATED IRON GALLERY posted elsewhere. Major replacements include the Riverside Stadium, home to the Middlesbrough Football Club, and Middlesbrough College. 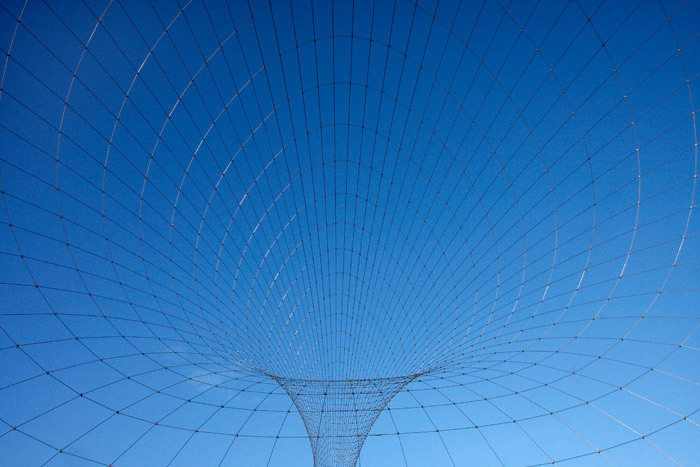 Temenos, a sculpture on an epic scale, joined them in 2010. It's some 165 feet high and by space occupied is currently the largest in Britain. 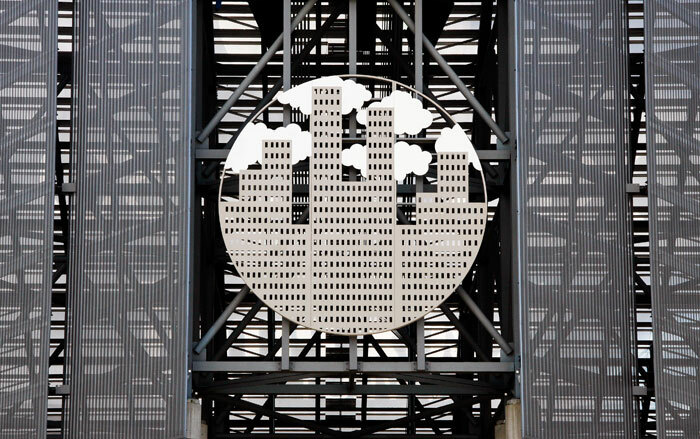 In 1999 another large-scale piece, Tarantara, was installed in the opened out shell of the Baltic Flour Mill in Gateshead during its conversion to a museum of contemporary art, the Baltic. Its flexible crimson double-ended trumpet form filled the building's enormous void. I recall visiting what was also a building site to see the taut PVC form suspended within walls supported by heavy steelwork. 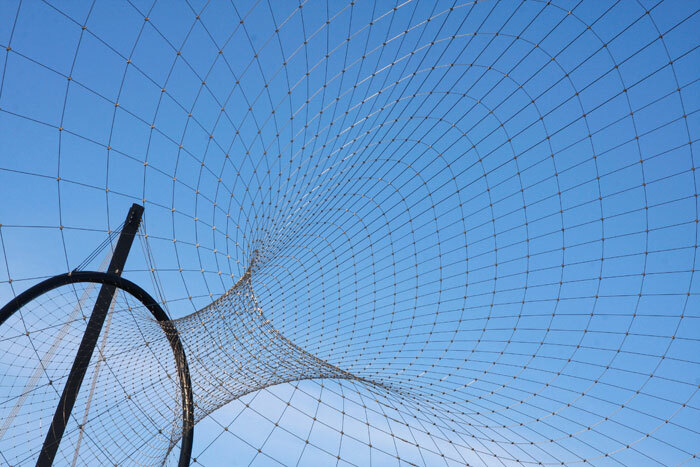 Anish Kapoor was born in India in 1954 but has lived in Britain since the early seventies, working since in a range of forms, materials and scales. Marsyas, a work similar to Tarantara occupied the vast space within the Turbine Hall at Tate Modern in 2002. He works closely with Cecil Balmond, an engineer who also collaborates with distinguished architects on international projects. 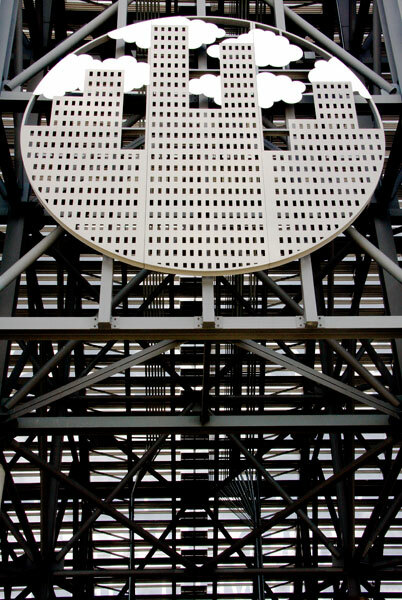 The ArcelorMittal Orbit for the London Olympics 2012 is a more recent collaboration. 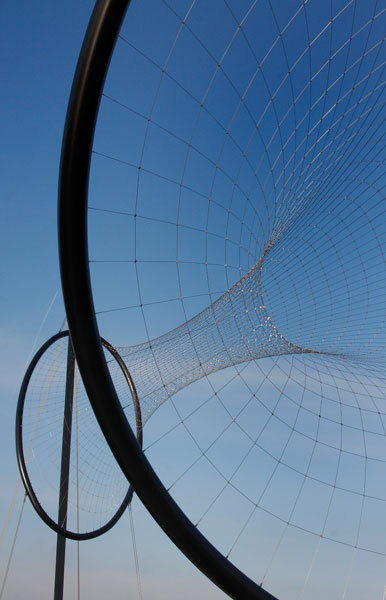 The sculpture's Greek title translates as ‘sacred ground', said to refer to that within the nearby soccer stadium. 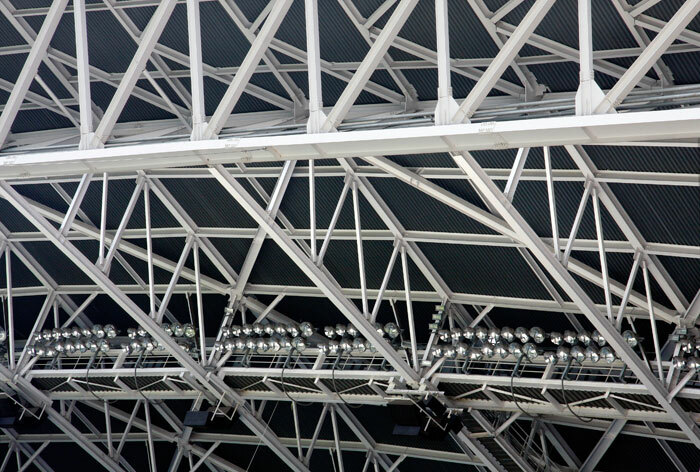 There, the continuous roof over the spectator stands is supported on white painted steel cantilevers on their own massive scale. 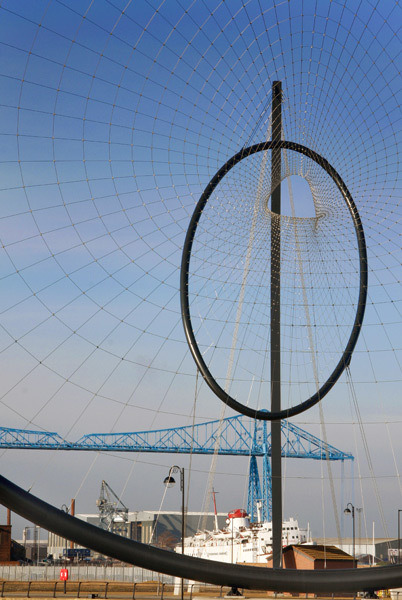 Set to the south, it contrasts with the many curves of Temenos and with the Transporter Bridge beyond. 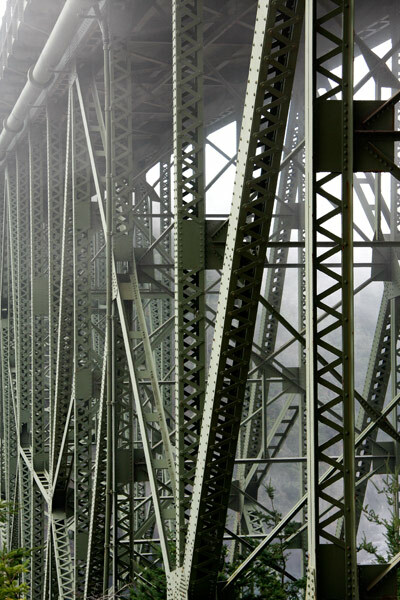 The two-part Deception Pass Bridge in Washington State was completed in 1935. The northern section is a 511 feet steel truss arch over Canoe Pass linking Fidalgo to the rock outcrop of Pass Island. 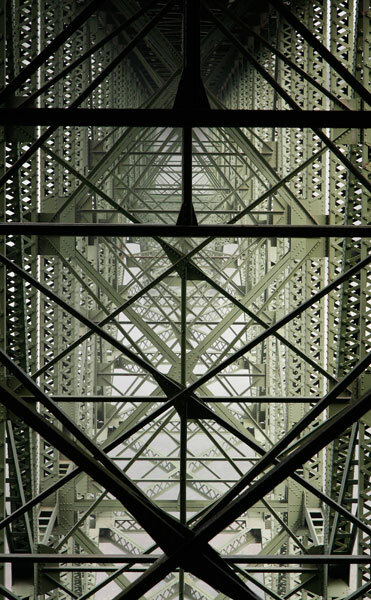 The second link to Whidbey Island is a truss cantilever with a central span of 976 feet. Strong tidal waters pour through the narrow constrictions. Many people visit the State Park surrounding the bridge and weekends can be busy. On this day many arrived in convoys astride large and loud motorbikes to meet and talk before moving on. The bridge, the woodland trails and beaches strewn with bleached driftwood trees are best for walking and photography at quieter times. A plaque at the bridge records: "NAMED BY CAPTAIN GEORGE VANCOUVER, 10 JUNE 1792. FEELING THAT HE HAD BEEN "DECEIVED" AS TO THE NATURE OF THE INNER WATERWAY, PORT GARDNER (NOW SARATOGA PASSAGE), HE WROTE ON HIS CHART "DECEPTION PASS". HE HONORED MASTER JOSEPH WHIDBEY, WHO FOUND THE PASSAGE WHILE COMMANDING A SMALL-BOAT CREW OF EXPLORERS, BY NAMING THE ISLAND "WHIDBEY". 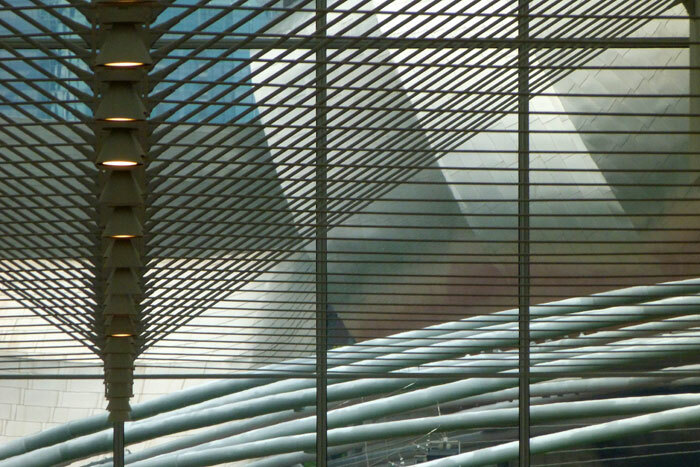 The structure of the East Monroe Street entrance hall of the Renzo Piano designed Modern Wing at the Art Institute of Chicago frames part of Frank Gehry's Pritzker Pavilion in the Millennium Park beyond. As the River Tees flows the final miles to the North Sea it meanders through a flat landscape, its banks standing just a few metres above the high tide mark. Industrial Middlesbrough evolved in the nineteenth century at the beginning of which the river crossing at this point was by rowing boat. By its end, travel was by steam ferries carrying up to 900 people. Here, a bridge replacement over a navigable river to link with Port Clarence required an unconventional solution. 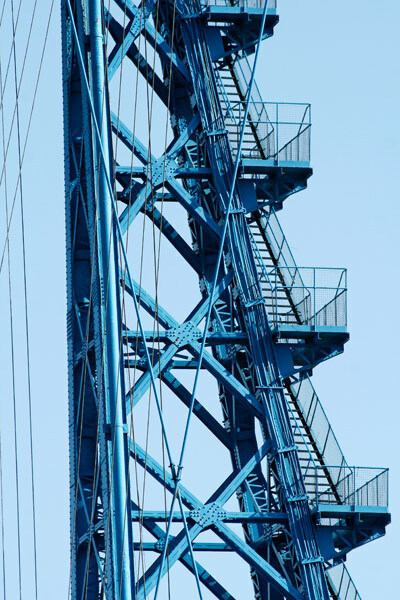 In 1893 the French engineer Ferdinand Arnodin's pioneering transporter bridge was opened in the northern Spanish town of Portugalete. Some twenty similar bridges were built between 1893 and 1916. Eleven remain but not all are operable. 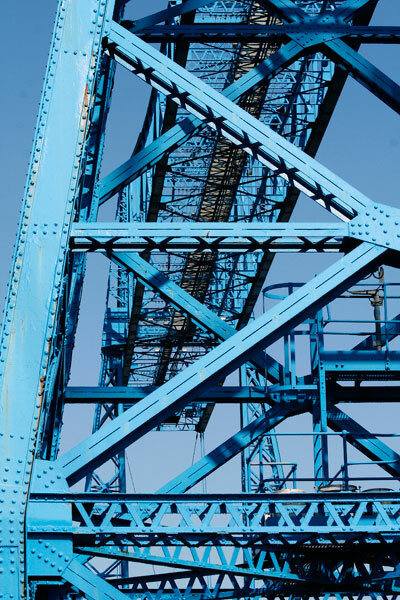 Designed and constructed by the Cleveland Bridge & Engineering Company and Sir William Arrol & Company of Glasgow, the Middlesbrough Transporter Bridge was opened in 1911. It's now the largest of its type in everyday use. 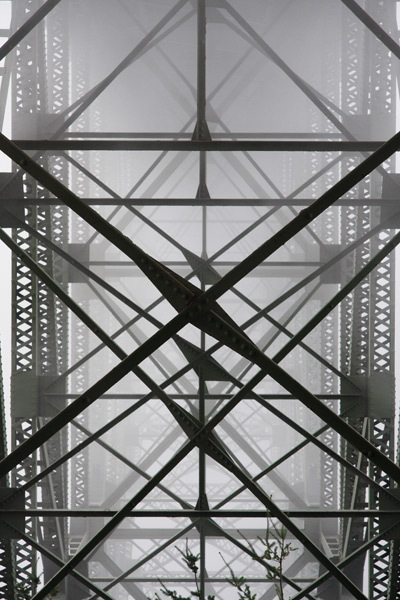 The flat underside of the two 851 feet long joined cantilever spans is 160 feet above high water: the span between the two pairs of supporting towers is 571 feet. The vehicle and passenger gondola is suspended by steel cables below a wheeled bogie running on rails below the cantilevers. Movement is by a cable linked to a winding engine on the Middlesbrough bank. 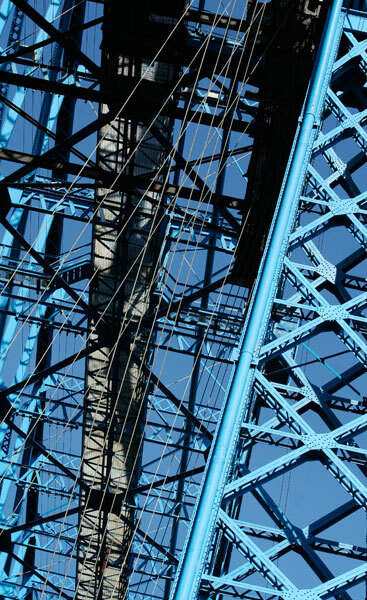 The TRANSPORTER BRIDGE GALLERY is devoted to a set of black and white images. 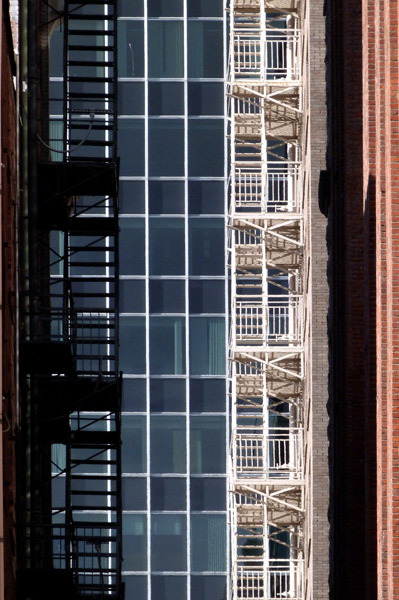 I was looking behind buildings in Seattle's Jackson Square area for details hidden from the main street grid. 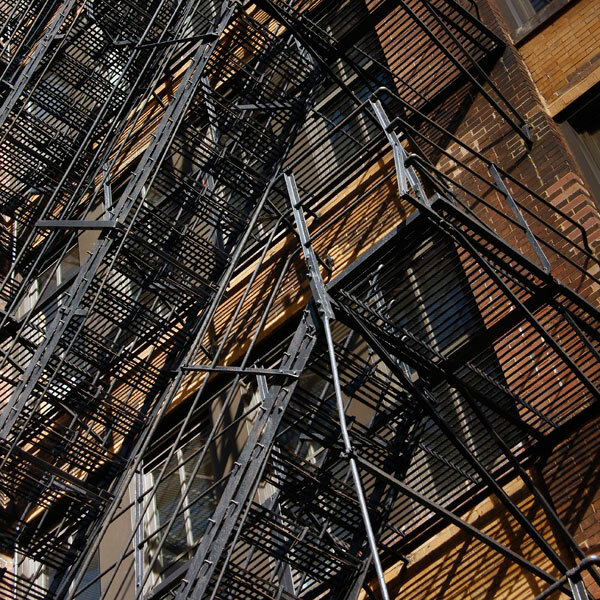 Here, I was interested in the late afternoon sun streaming between tall buildings to highlight the fire escape on the Hoge Building and the strong contrast created against its deeply shadowed counterpart. I also liked the vertical emphasis and the bold background window grid. I passed this (unrecorded) brick building and its fine fire escape whilst walking below the elevated railway tracks on South Wabash in the Chicago Loop.